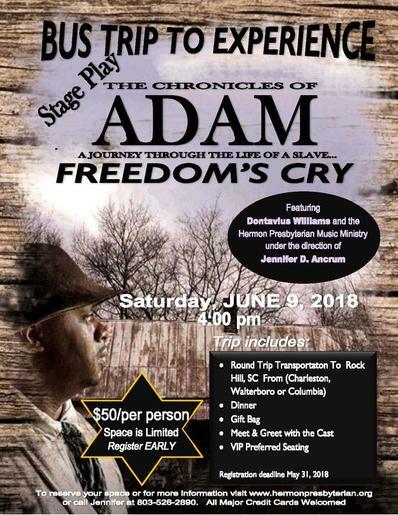 Since their combined efforts began in 2015, Hermon’s Music Ministry, along with Dontavius Williams, has produced the Chronicles of Adam; incorporating both theater and choral music. 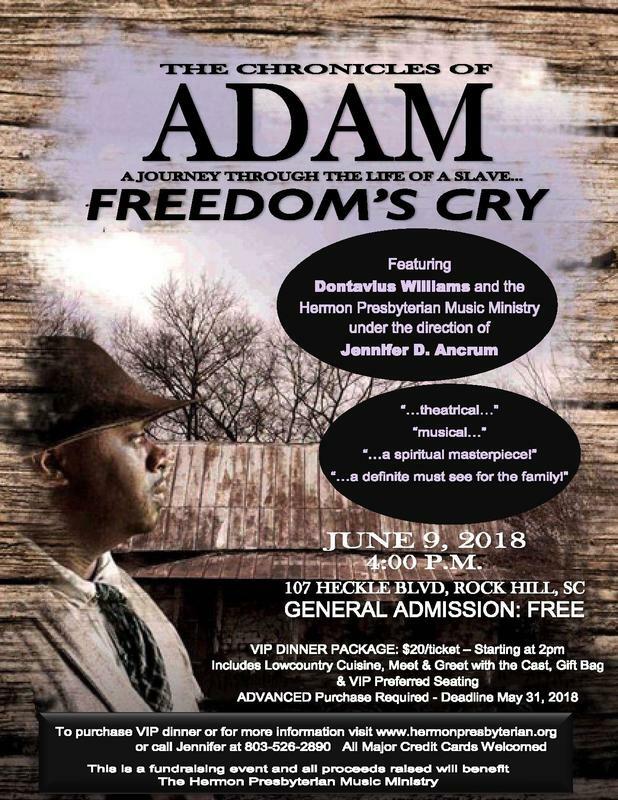 Equipped with God's vision, Minister of Music Jennifer D. Ancrum leads the group in this musical journey through the life, trials, tribulations and triumphs of a slave named Adam, as portrayed by noted historian and Living History Interpreter, Dontavius Williams. Spirituals and other songs, including sacred and folk songs, were common during the height of slavery. Aside from its more obvious purpose of communication, the music soothed the slaves and their friends through call and response - which was the norm on southern plantations at the time. The Chronicles aim to foster a connection between the audience and those enslaved in the 1800’s. 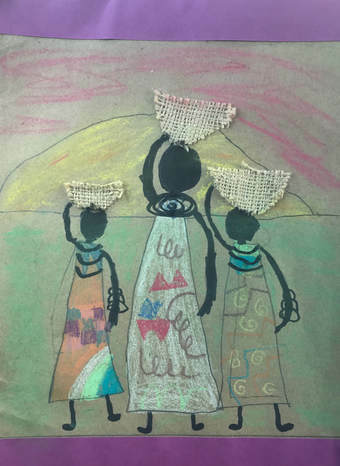 This spiritual masterpiece will feature powerful storytelling and various profound African-American Spirituals sung by the Hermon Presbyterian Music Ministry. This production is a definite "must-see" for the family! Click on the flyer to purchase VIP Dinner Package Tickets. In Charleston, Columbia, or Walterboro and need a ride? The VIP Travel Package includes round trip transportation via chartered bus with stops in Charleston, Walterboro and Columbia. The cost for the trip will be $50 per person/seat and will include a meal prepared in lowcountry cuisine, a meet & greet session with the cast (both beginning at 2pm), a gift bag & VIP Preferred seating for the event. Advanced purchase is required for the VIP Travel Package with a May 31st deadline. General Admission to event is FREE. As a bonus, we are offering a VIP Dinner Package which includes a meal prepared in lowcountry cuisine, a meet & greet session with the cast (both beginning at 2 pm), a gift bag & VIP preferred seating for the event. Advance purchase is required for the VIP Dinner Package with a May 31st deadline. Donations will be accepted during the event, and all proceeds collected will be used to benefit Hermon's Music Ministry. All VIP Package purchases (VIP Dinner Package and VIP Transportation Package) are non-refundable. If you need us, we will give you all the time you’ll need to answer your questions and learn more about us. Please give us a call at 803-526-2890 and allow us the opportunity to speak with you personally. Thank you so much for your time. We look forward to hearing from you soon and sharing the experience with you. Interested in learning more about Adam? Would you like our ministry to meet with yours? Would you like for our team to minister through music or drama at your church or event? Hermon’s Music and Drama Ministries are ministries in motion. We are ever - willing to minister through song, dance or dramatization with the sole purpose of educating persons into Christian maturity and empowering them to choose the right direction for their lives – a life in Jesus Christ. For more information, please contact us at 803-327-6015 or hermonpresbyterian@yahoo.com. We pray that you will be able to join us for this spiritual event. If you cannot be present, we would appreciate your prayers of thanksgiving as we praise God through song for what He’s done in our past, what He’s doing in our present, and what He will do in the future of the Hermon Presbyterian Church congregation and music ministry. If you'd like to donate to the ministry by check/money order, they should be made payable to Hermon Presbyterian Church (with Music Ministry Fundraiser in the "For" line. We look forward to sharing this wonderful event with you, our family members and our friends!